Support this project by purchasing a calendar! 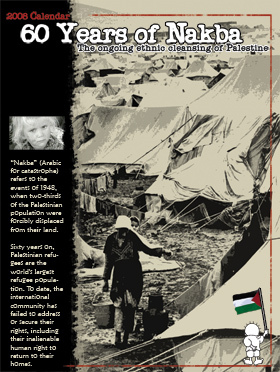 PalestineCalendar.org is proud to announce its 2008 calendar, commemorating the 60th anniversary of the Nakba. This informational and artistic calendar presents the Palestinian issue in 12 pages, each month tackling a topic. As with our previous calendars, dates of significance to the Palestinian cause are listed, and the calendar is produced and printed in Palestine. The pages are almost poster size (30cm x 43 cm) and are a mixture of art, photos, and text. This calendar makes the statement that the Nakba wasn't only in 1948, but is ongoing to this very day. It is a valuable advocacy tool, and makes an excellent gift. To support our sisters and brothers in Gaza, 15% out of each calendar sale during this year will be donated to Another Voice's campaign to raise awareness about Israel's siege on Gaza and mobilize action to oppose it. The retail price for the calendar is $20 plus $6 for shipping and handling (no matter how many calendars you order, and regardless of destination). For orders of 3 copies or more, we offer a discount of 20-50% off, to enable solidarity organizations to raise funds for their work, and make it easier for individuals to them as gifts. Shipping and handling is $6.00 for all destinations, regardless of the number of copies ordered. International orders of 25 or more are shipped via Express Mail (5 day delivery) at no additional charge.